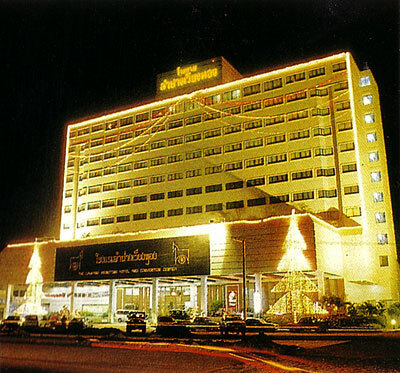 We take great pleasure in welcoming you to The Lampang Wiangthong hotel. Where we are ready to offer you all the amenities of a distinguished, Luxury hotel in a soothing environment of friendly smiles and tranquil beauty. Come and discovery a place where ancient culture prevails and the refined, highly personalized service is sure to delight and enchant you. 235 Exquisitely appointed guest rooms. Designed with the itinerant traveller in mind, or the stop-over tourist, and for those looking to find much variety in a small area, the Lampang Wiangthong provides convenience, comfort, communication and much more. Dining: Wiangthip coffee shop, Wiangphan open air terrace, Diana Chinese restaurant, Diana Western restaurant, Diana Japanese restaurant, 24 hour room service. Swimming pool, Karaoke, Discotheque, Barber & Beauty Parlour, Massage parlour. Open Air Convention area, convention halls, conference rooms accommodation up to 1,800 people. Other services include, in-house doctor, parking, room service, safe deposit boxes, baby sitter, cable and facsimile services.